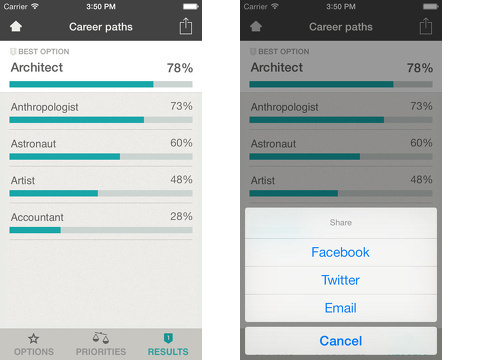 The Choice Map iPhone app is a surprisingly cool blend of BuzzFeed tests and pro-con lists. 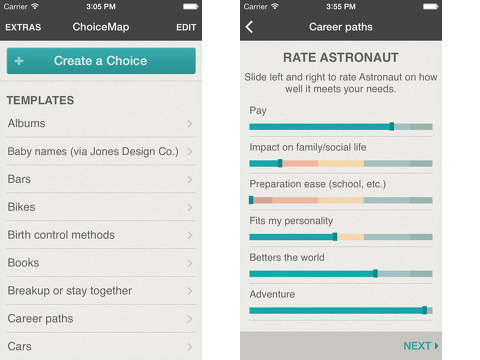 With the Choice Map iPhone app, you establish your priorities and weigh your options based on how strongly the factors weigh in your decision. The results blend the importance of each option and each priority. Where your choices intersect, you will find the highest percentage of compatibility. This free download from the iTunes App Store is a simple way to break down decisions. There is a seven page tutorial, navigated with finger swipes, to introduce you to the Choice Map iPhone app’s tools. It is helpful, but you should do a template choice to get a feel for it. They range from the frivolous like vacation spots to deciding to break up or stay together. Interestingly, the templates include many standard career choices like hiring, choosing jobs, and choosing between jobs in different cities. I found them to be insightful and thorough. You can, of course, edit and add additional elements to customize. You start your Choice Map by naming it. Next, you enter the items from which you must choose. For a template, your factors are loaded. If you make your own, then you will enter each factor you think is important to make the best choice. Then, you prioritize each factor by moving your finger on a volume-style adjustment. You choose between ignore, low, medium, high, and top. Next, you move to a screen where you weigh each factor as it relates to each choice. The choices for each priority range between awful, bad, ok, good, and ideal. For example, if you have determined schedule flexibility is a high factor, but a job you are considering has awful flexibility, the Choice Map iPhone app calculates and quantifies that decision for you. It calculates the relationships you have identified for all priorities with each choice, and your results are shared as a percentage. The highest percentage reflects the choice with most compatible priorities. You can find each Choice Map at the top of the list of templates. It is possible to re-examine and re-calculate previously completed choices. You can also share to email, Facebook, and Twitter. The clean graphics, step-by-step navigation, and intuitive gesture controls make the Choice Map iPhone app a helpful productivity tool. AppSafari review of ChoiceMap was written by Jenni Ward on February 5th, 2014 and categorized under App Store, Enterprise, Free, Productivity, Utilities. Page viewed 4204 times, 1 so far today. Need help on using these apps? Please read the Help Page. STIFF ‘EM! – The Tip Calculating Game!